Ganesh Chaturthi is very auspicious occasion before the Diwali festival and everybody wants to decorate their home in different style to welcome Ganesha. Here we bring some unique ideas which can help you to decorate your home just before you bring the Ganesha at home. Ganesh Chaturthi also known as Vinayaka Chaturthi or Vinayaka Chavithi is celebrated all over the India especially in the Western India such as Maharashtra in the month of Bhaadrapada (August to September). It is a 10 days festival starts in shuklachaturthi and ends on Anantchaturdashi. People bring beautiful Ganesh idols at home on the day of the festival and placed it on raised platforms in homes to view and pay their homage and on the last day Ganesh Chaturthi after the final offerings or puja people carry the idol to the river to immerse it. Here is the list of some Home decorating ideas for Ganesh Chaturthi especially to decorate your Puja room to celebrate this festival with enthusiasm. - It is very important to place Ganesha Idol at right place. The northeast corner of the house is related to prosperity and happiness so it is the best direction to place Ganesha Idol which is clean and calm. - Clean the home or place where you want to place Ganesha Idol and sprinkle ganga water to attain the sense of purity. Prepare a raised platform to put the idol and decorate the place well. You can purchase ready made decorated temple-like structures called maker from market. - Decorate the walls of your Puja room or place where you want to put Ganesha Idol with beautiful bright colors like yellow, green, red and so on. You can decorate the walls with bright color curtains and balloons. Use old sarees and dupattas to make curtains for your puja room walls. - You can use your imagination to create beautiful temple or makar at home or get them design from the professional. You can choose some shapes like rat, book, butterfly and so on to create a mandap. - Hang beautiful garlands, bells and other Door Hangings from your ceiling to give your place a beautiful and complete look. 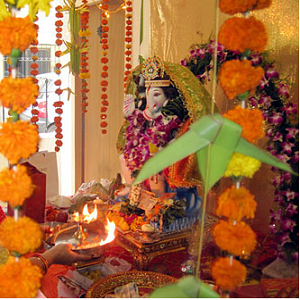 - Decorate the temple with natural flowers to give it a festive look. - Decorate the whole home with earthen lamps and candles to complete your decorations and lighten the puja room. - Once you have done with your decorations now it's time to bring Ganesha at home. Place the idol of Lord Ganesha and kalash on the makar or raised platform covered with red cloth and fill the empty spaces with flower petals, beads and shells. - Decorate your Ganesha Idol with natural flower garlands, you can also use dry fruit garlands or can made fresh fruit garland which you can later distribute as parsada and place lots of sweets also. - Do not forget to lighten the incenses sticks for beautiful fragrance to build a spiritual and pure ambiance. Festivals bring blessings of god and fill our life with joy but sometimes they cause environmental damages also. Here are some tips to celebrate Eco Friendly Ganesh Chaturthi to reduce the environmental damage from Ganpati celebrations. - Do not use idols made from POP try to get idols made up of unbaked natural clay, natural fibre, or recycled paper colored with organic or vegetable colors. - Do not use very bigger size idols it, try to get maximum to 5 feet or 1.5 meters idols for puja as huge idols consume more clay or POP and add more waste to environment. - Use organic material such as cloth, wood, paper, natural flowers and other natural materials that are safer when immersed in water or can be recycled later for Ganesh Chaturthi decorations. - Do not use too much light in your decorations, decorate your home with earthen lamps and candles that look much beautiful and also add festive looks in your decorations. - Do not immerse the idols in sea use artificial tank or artificial immersion tank instead of natural water source like river, lake or pond. You can opt for Symbolic immersion, use metal or stone idol and symbolically immerse this in a bucket of water. You can also carry it in procession to the sea hold it under the water and then bring it back home for the next year. - Try to minimize the noise pollution.